We have worked closely with the project team at Leeds Victoria gate to ensure we minimise the environmental impacts of the development. Working with our subcontractor Moorhead Demolition, 99% of the waste materials generated from the demolition of an existing 1960s concrete framed commercial building have been diverted from landfill, with structural material such as concrete, brick and slate crushed and recycled on site for use as fill material. With the aid of an onsite crusher, concrete, brick and slate were processed to create 5,200m³ of graded fill material, which was used to infill the existing basement and to create the 750mm piling mat; this negated the need for the removal and disposal of the demolition waste off site, saving approximately £91,000 in waste disposal costs and 14 tonnes of carbon. 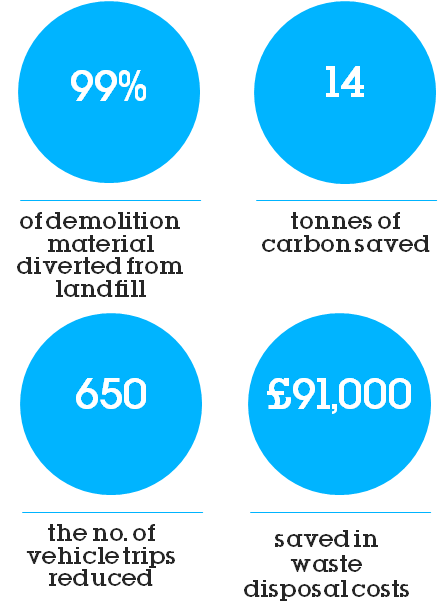 Crushing and reusing the demolition arisings onsite also removed the need for the extraction and delivery of virgin material to site, further reducing our impact on the environment. 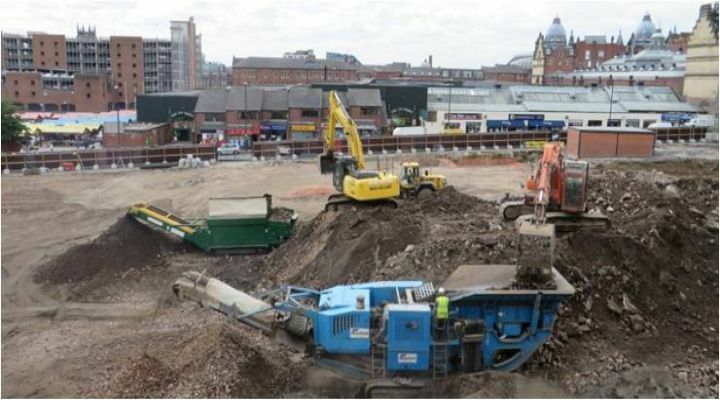 Our project team on the Leeds Victoria Gate project have successfully reduced the volume of mains water used for dust suppression during the demolition phase of the works. Mains water use was reduced by approximately900,000 litres by utilising waste groundwater that wouldn't have otherwise been used. During construction of the 220 rotary bored piles, the water table was encountered resulting in water rising up through the rotary pile bores. Whilst ordinarily this waste water would have been disposed of by discharging via a settlement tank into the mixed sewer, the project team along with Simplex West Pile, recognised an opportunity to use the groundwater for dust suppression and reduce the requirement for mains water. Groundwater arising from the piling was pumped into a settlement tank in order for any solid particles to settle before the water was passed through to a storage tank. Once the water stored was analysed (e.g. for legionnaires). it was used by two ‘Dust Busters’ (water cannons) on site to control and suppress airborne dust arising from demolition activities. By utilising the groundwater that would have otherwise been discharged, the project team reduced demand for mains water, saving money, carbon and improving air quality.